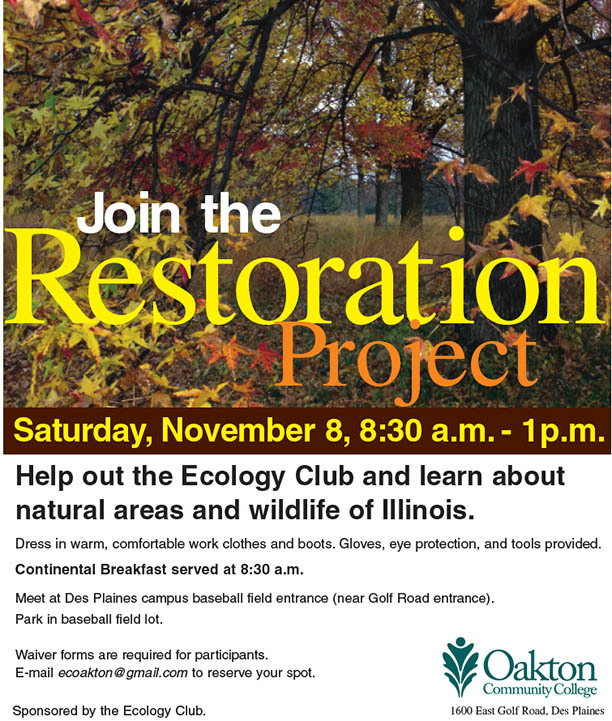 If you are interested in spending some time outside in nature, making friends, and maybe getting a little dirty–we invite you to join the Oakton Community College Ecology Club for their annual Fall Restoration Project here at the Des Plaines campus. Community members are invited–you do not need to be a current student in order to attend. Contact ecooakton@gmail.com to reserve your spot. Categories: Community Action, Student Engagement, Volunteer Opportunity | Tags: Campus Events, Community, Ecology Club, Forest Preserve, Habitat Restoration, Wildlife | Permalink. Audubon Internship Openings in Cook County!! The Audubon Intern program is hiring! We will be bringing on 2-3 new interns to work from mid-November to mid-May in the southern half of Cook County. Interns will be focusing on invasive species removal over the winter, and will participate in prescribed burns and herbaceous invasives removal in the spring. Experience is not necessary, but we are looking for folks who have a passion for the outdoors, a hunger for knowledge, and the physical ability to withstand long, exhausting days in the field. Interns are exposed to working with Forest Preserves of Cook County staff as well as volunteer stewards. Categories: Community Action, Internship, Leadership | Tags: Forest Preserve, Habitat Restoration, Internship, Sustainability | Permalink. This Thursday, October 23, Oakton Community College will be recognized by Governor Quinn and the Illinois Green Governments Coordinating Council for reaching the Bronze Level on the Illinois Campus Sustainability Compact. The Compact as served as a set of guidelines for us to better track and shape our initiatives. As a College, we have committed to reaching the Silver Level by highlighting and developing a number of sustainability initiatives throughout our operations and practices. Endorse a written statement, declaration or policy acknowledging support for sustainability–Oakton has been on a green trajectory for several years now and a special emphasis on creating a “Green College” was placed in our previous Strategic Plan–resulting in the creation of a Green Committee. With the current Strategic Plan “Connecting What Matters”, our efforts to green the campuses have been acknowledged and we look forward to continuing the work that we have started as we strive to meet the Silver Level of the Compact in 2015. Designate a focal point to lead and/or coordinate sustainability efforts across the campus–Currently made up of 20 staff and faculty representing several departments as well as a student representative, the Green Committee has been guiding the College towards sustainable options in purchasing, new construction and general operations, providing communications and opportunities for involvement across the Oakton Community. In addition, the position of Sustainability Specialist was created and filled in 2014 to work with the Green Committee in supporting green initiatives across the College. Create a website that highlights the institution’s sustainability programs with the purpose of increasing awareness and generating interest–Our website showcases some of our current and recent initiatives and is currently under revision to include even more detail on the green initiatives underway. We look forward to sharing them all with you! In addition to the website, the “Keeping it Green at Oakton” blog as well as a Facebook page were created in order to keep the community better informed of our progress and opportunities for involvement. Create opportunities for students and faculty to provide suggestions for advancing sustainability on campus— In addition to suggestion boxes posted at events where the Green Committee hosts information tables, students, staff, faculty and community members are all encouraged to contact us to find out more about our sustainability initiatives, to offer suggestions on areas for improvement and find ways to become more involved. In addition to the venues noted above, we also encourage individuals to contact the Green Committee at greenteam@oakton.edu. We at Oakton are extremely proud of the progress we have been making in sustainability and look forward to sharing more about our efforts as we move forward on our commitment with the Illinois Campus Sustainability Compact. Categories: Campus Initiatives, Leadership | Tags: Campus Events, Sustainability | Permalink. Calling all Young Leaders, Visionaries, and Project Designers! Are you inspired to make positive change in your community? Do you have an idea for global social or environmental action? Are you seeking support for an existing project or one you want to start? Apply now to the Lead Now Fellowship! The Lead Now Fellowship is looking for youth leaders, ages 13-26, to carry out sustainable development projects focused on improving the community’s social, economic, and environmental wellbeing. The Lead Now Fellowship is an opportunity for support and training over a six-month period. This unique peer-to-peer learning experience provides training sessions and mentorship, a support system for brainstorming and troubleshooting, and an in-person leadership workshop that allows fellows to meet, share ideas and grow as leaders. The fellowship award includes a small stipend. Categories: Community Action, Leadership, Student Engagement | Tags: Community, Paid, Scholarship/Fellowship, Student Challenge, Sustainability | Permalink. 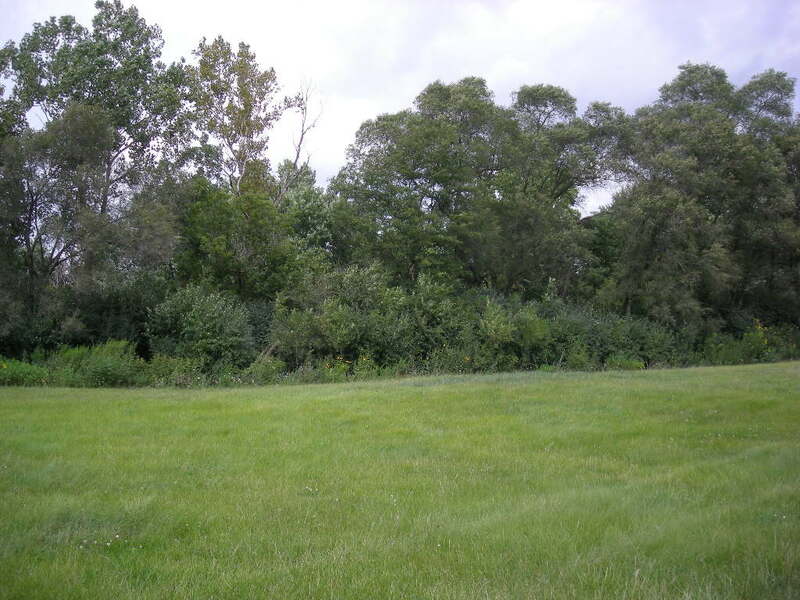 Oakton Community College’s Des Plaines Campus–Certified Wildlife Habitat! While Oakton Community College fosters student success and academic excellence through its course offerings and training programs, we also strive to make a positive impact on the natural world around us and serve as a leader for sustainability in our communities. 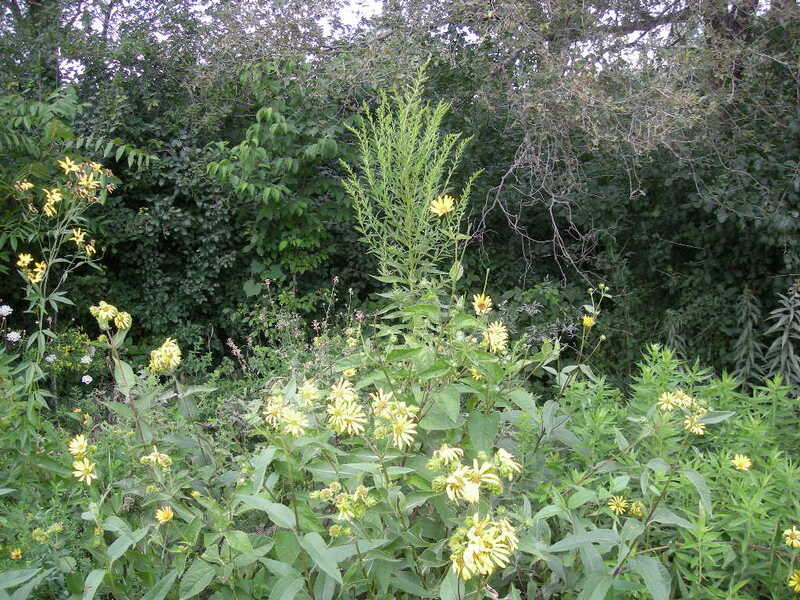 We are excited to announce that Oakton’s Des Plaines campus is now a Certified Wildlife Habitat! Our careful planning, support of natural ecosystems, restoration of prairie spaces and use of native species in landscaping has helped us achieve this certification through the National Wildlife Federation. Roughly 46,000 students and 700 faculty/staff call Oakton home for at least part of their academic and/or professional pursuits. But our campuses are also home to a variety of other inhabitants who may not be as readily noticed. 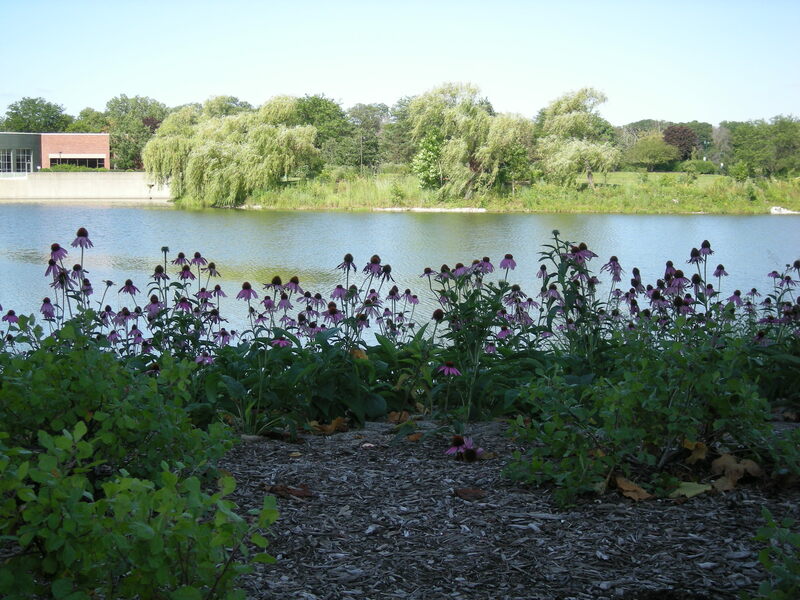 Sitting adjacent to Cook County Forest Preserves and Kloempken Prairie, Des Plaines campus is especially beneficial to a variety of wildlife and an important protector of valuable ecosystems in our community. Our campus is now recognized as for providing essential elements needed by all wildlife – natural food sources, clean water, cover and places to raise young. From native plants like asters, cardinal flowers, goldenrod, old oak trees, to the fallen logs holding a variety of fungal species to Lake Oakton itself, we have acres of usable habitat for animals–whether for permanent use or as a green stop along migration routes. The campus is home to dragonflies, monarch butterflies, squirrels, hawks, snakes, voles, frogs, deer, even hummingbirds (and that is only naming a few)! Next time you step foot on campus, take a second to enjoy the beautiful areas and think about how many other species are calling this place home! “Providing a home for wildlife in our communities – whether it’s at home, or in schools businesses or parks – is the demonstration of a healthy and active eco-system. There is no more rewarding way to stay connected to nature right outside your door,” David Mizejewski, naturalist with the National Wildlife Federation. NWF’s Certified Wildlife Habitat program has been helping people take personal action on behalf of wildlife for more than 40 years. The program engages homeowners, businesses, schools, churches, parks and other institutions that want to make their communities wildlife friendly. This new certified habitat joins NWF’s roll of more than 150,000 certified habitats nationwide. Wildlife habitats are important to year-round wildlife residents as well as species that migrate, such as some birds and butterflies. Each habitat is unique for both beauty and function. 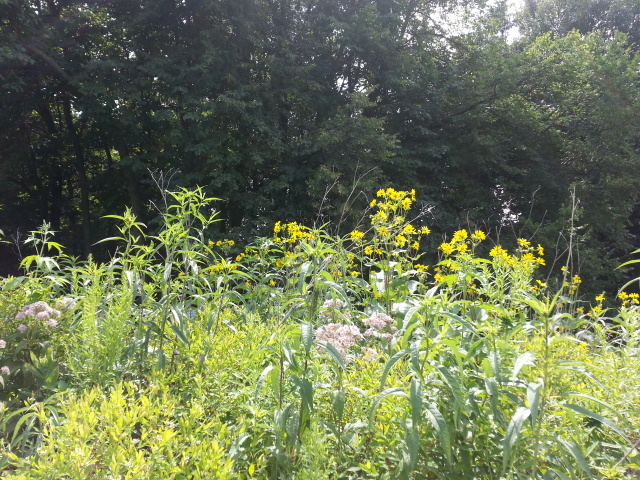 Categories: Campus Initiatives | Tags: Campus Events, Forest Preserve, Wildlife | Permalink.